Blue Front Fiss, Doerr & Carroll Horse Co.
Fiss, Doerr & Carroll Horse Co. 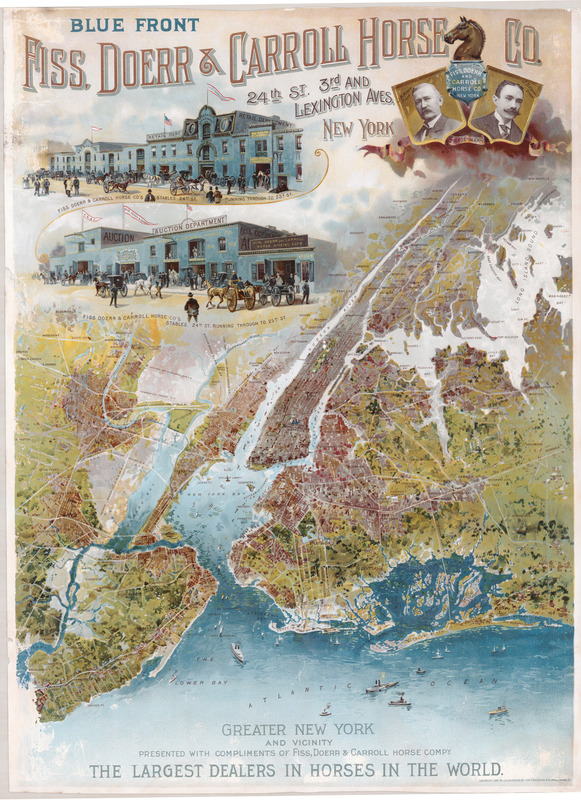 This striking, late-19th century map-poster of New York was created as a promotion for the Fiss, Doerr & Carroll Horse Company, the self-styled "largest dealers in horses in the world." Above the map are renderings of the company's trade mark "Blue Front" buildings, the "Retail Department" and the "Auction Department," located between 23rd & 25th Streets and Lexington & Third Avenues, along with portraits of President J.B. Doerr and Treasurer J.D. Carroll. The map is a birds-eye view, very much in vogue at the time, with the company's Kip's Bay location at the epicenter. The poster was produced by the distinguished American chromo lithographer Julius Bien in 1897. We have an unusual amount of printing history concerning this map because a writer for Printers' Ink, waiting at an elevated train stop, "was attracted by the poster of the Fiss, Doerr & Carroll Horse Company, so much in evidence" - not this poster, as will become apparent - and secured an interview with Joseph Carroll in March 1897. Carroll said that the company and its predecessors had been in business at the same site for 32 years, and that the company sold an average of "not less than about 900 horses weekly" in its auction sales alone. Schwartz 1897, 10. In response to questions about the firm's advertising, Carroll reported that the company's experience had "made us the very staunchest advocates of publicity." Discussing future plans, Carroll said that $4,800 (about $135,000 in 2016 dollars) "will be devoted this year to a map of Greater New York, together with pictures of the company's buildings, and portraits of the firm's members. This is said to be the most accurate map of Greater New York thus far published. The plate, which is in 18 colors, cost $3,000; 25,000 copies of it are to be distributed among our customers and business houses, framed and covered with glass." Ibid. Certainly not "the most accurate map of Greater New York thus far published," it is nevertheless among the most attractive. It seems unlikely that 25,000 copies were distributed - let alone framed and glazed - because neither the dealer who sold this copy to me nor I have been able to locate another. In about 1902, the company published a 72-page, hard-cover, promotional book "To Our Customers and Friends." Among other things, this work described a recently-added "high class coach horse stable," adjacent to the firm's Forest View Stock Farm in Westchester County, and a brand new "trotting horse department." Formal photographs are provided of the company's officers and employees, along with various facilities at the Kips Bay headquarters, the "Export Barn" (on the Hudson at 36th Street) and in Westchester. There are scores of advertisements for carriages, harnesses, sleigh robes, blankets, horse rubs, colic cures, hay and feed, etc. The text extolls the strength of the American horse market ("it is pre-eminently the age of the horse") and the "far-reaching and ever extending influence of America's greatest horse-dealing firm, the Fiss, Doerr & Carroll Horse Company," with sales of "as many as 600 horses . . . in one day." By 1907, the company had expanded further with the completion of a seven-story stable on East 24th Street linked by ramps and passages to a grand new auction building. The auction market was "an exuberant mixture of Roman classicism and Beaux-Arts grandeur," with a limestone facade and "high, arched attic windows." It enclosed a huge interior auction space, 65 by 197 feet, with accommodations for up to 1,000 spectators under a steel arch roof and a "suspended, coffered ceiling." Gray 1987. Alas, the "age of the horse" was already beginning to yield to the automobile age. In April of 1907, "A Journal for Those Employing Commercial Motor Vehicles" reported "an event . . . which strongly fortifies the faith of those who believe that the vast bulk of city merchandise will soon be carried in power wagons. The largest and most influential firm of draft animal dealers in the world - Fiss, Doerr & Carroll, of New York City - realizing that further opposition to the commercial motor vehicle is both futile and hazardous, has decided to espouse its cause and sell motor trucks in the market it so thoroughly dominates through its horse sales. . . . No more notable conversion than this has occurred in the brief but brilliant history of the motor wagon." The Power Wagon 29:3, April 1907. By 1928, Fiss, Doerr was no more, and the R&T Garage Company purchased the elegant Beaux-Arts auction mart. Gray 1987. In the 1990s, after an historic preservation fight, the entire block where the Blue Front buildings and the later auction mart had stood was demolished and replaced by new facilities of Baruch College. Lithographer Julius Bien (1826-1909) is best known for his chromolithographic, elephant folio edition of Audubon’s Birds of America. “In the 1860’s Bien began to specialize in the production of lithographed maps and charts. For the rest of the century, he produced maps for nearly all the major American geographical and geological publications and for the decennial census reports. Bien developed new coloring and shading techniques, was an early user of photolithography, and was instrumental in establishing scientific standards for American cartography.” Last 2005, 36-37. Portions of the foregoing courtesy Michael Buehler, Boston Fine Maps.